what’s wrong with my iPod? I have now owned my iPod since June of this year and I believe I can finally give my thoughts on this whole iPod obsession. I think it’s a nice innovation but I’m not a big fan. In theory and practice, the Apple iPod is a really neat toy. It can hold hundreds of your favorite CDs all in one place. It’s instantly on when you hit a couple of buttons; No more waiting for the CD player to load. If you want to automatically load music (AAC or MP3) on it, there are multiple ways of doing it. You can connect it to both USB and Firewire ports to transfer files. And it’s light and small and very portable. But that’s pretty much where my enjoyment ends. I know what I’m looking for is more like a portable hard drive which I can carry around with all of my data and media. But, unfortunately, this’ll have to do for now. Nothing seems to do what I want because everyone is afraid of DRM, or digital rights management. If the copyright laws weren’t such a big deal, I’d probably have exactly what I want. Basically what this means is that Apple requires that its iTunes media files be proprietary, or in other words you can’t use their music on any other device without illegally modifying it. So, there’s no reason to buy music from iTunes if you don’t have an iPod (unless you don’t care about portability). Simple as that. Another problem that I have is transferring music to and from the iPod to the computer. The iPod can copy one one way: from the computer to the iPod. Apple doesn’t want you to “pirate” media to and from your friend’s or family’s other computers. Which means you can only use your iPod on one computer. Why would I want to use it on more than one computer, you might ask? For many reasons, but foremost because I listen to podcasts! I want to be able to transfer podcasts, which are completely free and legal, to and from any computer I use whether it be work or home! Why can’t I do that?! One other thing: I hate iTunes. Can you believe it? I seriously think it’s over-bloated crap that installs extra features, icons and services onto your computer without your approval. I still prefer Winamp and use it almost exclusively. It’s smaller, faster, and does what I want quickly. It could certainly use a few features that iTunes has (and vice versa) but other than that, I’m still satisfied with Winamp. To the contrary, I must state that using iTunes on a Mac really isn’t all that bad (since I’m still used to applications being rather slow anyway), but using it on a PC is horribly slow and uncomfortable to me. It’s not designed for PC use and it wastes my resources (check your task manager and you’ll see that there are typically two or three different services running at once when iTunes is running) and time trying to figure out how to use it with my iPod. I typically have a nightmare when I want to copy over music from my playlist to the iPod. Instead of it being a click and drag, it’s more like go to the iPod playlist in iTunes and import what you want. It’s tedious, a waste of time and effort, and I can do exactly what I want with Winamp with no effort or thought. So, I stated a few problems that I hate. Is there a solution to this mess? I’ve been using a plugin to Winamp called mlipod. It allows me to do everything that iTunes does, but the way I want to do it rather than how iTunes forces me to. I can transfer everything using Winamp and I don’t have to have the bloated iTunes software to use it! So I just uninstall iTunes all together. Thank God! To one up that, there’s even slicker software called Anapod that allows you to use iPod like a separate hard drive, pretty much exactly what I’m looking for. It requires a fee to use it but if you’re looking for a really great alternative to iTunes, this might be in your answer. One more that I found in May 2009 is called Rockbox, which is an open source solution! It’s more of a complete makeover for your iPod but its features completely blow the regular iPod software functionality away. For instance, it supports multiple codecs other than mp3 and AAC, it actually has a real 5-band equalizer, crossfading, on the fly playlists, and many open source plugins. So are there any good alternatives to the iPod that allow me to do all of these things with fast software? Not that I know of. I think the best thing to do is find out what has the best bang for the buck and then see if there is alternative software for that player. Otherwise, you’re stuck with a pretty toy that has extreme limits from its maker. Note to self: invest in your future. If only I was smart enough to do the research, patent this technology and market it, investing in reproduction of microscopic hair cells in the cochlea located in the inner ears would make me a billionaire. My generation is going to have severe hearing loss when we get older, and the iPods and iPod knockoffs are one of the main causes. But that’s like saying guns cause death. People who constantly use iPods and iPod knockoffs at high levels will go deaf unless they limit the amount of noise they allow into their ears on a daily basis. I’ve already got hearing loss with my ongoing, annoying tinnitus, most of which wasn’t even caused by my CD/digital music players. I think this really is the best research to invest in right now and when I manage to figure out way of doing it, I also plan to invest money in this area. I’m definitely going to need the help as I age because hearing loss runs rampant in my family already. Ya know, because I have nothing better to do in my free time, I decided after a little research to sign up for one of these pyramid triangles promising me an iPod. Thus, I am going for the 60GB photo iPod as described in this offer. So why, after all of this time of hearing about it, would I do this? 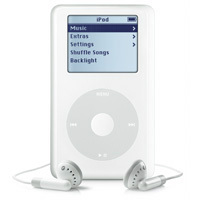 I think that the iPod is revolutionary, it’s a toy that would be really awesome to own for so many reasons, most of which include the fact that I’m an AVID music fan, love listening to music and it is pretty much a huge part of my life. Thus, this offer. So, if you don’t mind spending a little time on the survey and want to get a free iPod of your own, click on my link. For references of its validity, go to the following websites for the positives and negatives. is iTunes Music Store worth your money? Probably not. It seems that those big bad guys at the RIAA are once again taking all the profits directly. How much? All 99 cents per song is going to the RIAA and Apple is losing money in the process. Why does this not surprise me? So I guess the question would be where is Apple making its money? From the iPod. Not a bad product if I do say so myself. But definitely not worth it for the majority of everyone. We’re talking about .0005% of anyone who might even have one, and that’s probably a little liberal of an estimate. If the RIAA doesn’t cut some slack, change their business model, do anything that helps the artist/consumer relationship, iTunes will probably fold in a few months/years. Same goes with Napster 2.0, Rhapsody, and any other pay-per-use download service.